Which country drinks the most coffee? - Nisbets Australia Blog - Industry news, trends, recipes and more! Google searches into the origins of coffee can soon become marred with spurious facts. Some sources describe a scene from the Sufi monasteries of Yemen; other hark back to unsubstantiated reports from 10th Century Ethiopia. What we do know from social documents emerging from the late 17th Century is how coffee culture exploded across Europe, with customers freely engaging in political and philosophical debate in the inaugural coffee houses of a newly awakened world. With independently owned stores dominating the café scene, how is it that Australia has developed such a world-class standard of coffee whilst being so isolated from the rest of the world? As we know, great quality espresso is readily available in most places in Australia, but how does consumption vary across the globe? The first signs of a coffee breakthrough in Australia came in the mid-19th Century, as a couple of discerning Queensland farmers realised that their surrounding environment was a perfect growing climate for some subspecies of the flowering plant. Unfortunately, by the early 1900s the emerging market was cut short by a lack of cheap labour and hit by a hideous natural disaster. It took the best part of 80 years for coffee to resurface on the continent, with help from major technological innovations such as Nat Jaques' mechanical harvester. Who consumes the most coffee worldwide? If we were to look exclusively at this infographic showing the amount of cups consumed per capita, then you could argue that the Netherlands are a head above the rest. However, to get a sense of the bigger picture, we have to drill down a little further into global sales of the raw product. In 2013, caffeine informer released figures which recorded the amount of coffee purchased from Nations around the world, in the form of its dry, packaged weight. "Because the conversion factor to reach brewed volume varies from market to market, depending on preferred strengths, etc., looking at dry volume figures across countries provides a more apples to apples comparison” - Beverages Analyst, Dana LaMendola. During 2013, Finland had managed an astounding 9.6Kg per Capita, closely followed by Norway, the Netherlands, Slovenia, and Austria in fifth place. Australia took a modest 2.6Kg per capita and earning a considerably 28th place on the list. The UK sat rigidly in 40th place, a fair reflection on a nation of avid tea drinkers. The average Fin drinks approximately 2.64 cups of coffee per day, higher than any other Nation. The admiration for coffee in Finland is so strong that coffee breaks are included in collective labour agreements, where workers are typically entitled to one coffee break every four hours, or two if they must work six in succession. Incidentally, the profession which demands the most caffeine intake is journalism and media staff, according to Pressat. In a blog released by 'ilovecoffee', Brazil is also the biggest coffee producing Country, exporting around 54 and a half million bags per year. Giants like Starbucks didn’t work in Australia mainly because the sweetened additives simply didn’t appeal to Australian tastes. Particularly since 2012, coffee lovers have developed a desire for more organic blends and authentic taste in their brew. Even if you don’t have access to the best commercial coffee machines, competing with coffee shops isn’t all about technology. Fresh techniques are driving both large franchise outlets and independent coffee shops to create something unique to offer their customers. In any restaurant, bar, brassiere or bistro, offering espresso coffee to round off the meal is always an opportunistic and lucrative option for your business. Add a personal touch to your coffee with stencil art, all you need are the chocolate sprinkles or a blend of your own coffee-friendly ingredients like cinnamon or maybe try a little chicory instead. The stencil helps you to achieve consistent results and enhance the appearance of your product. If you’re just starting out or looking to branch out with a new coffee outlet, take no chances with hot drinks and invest in these stylish rippled cups for extra grip and insulation without being too hot for your customers to hold. 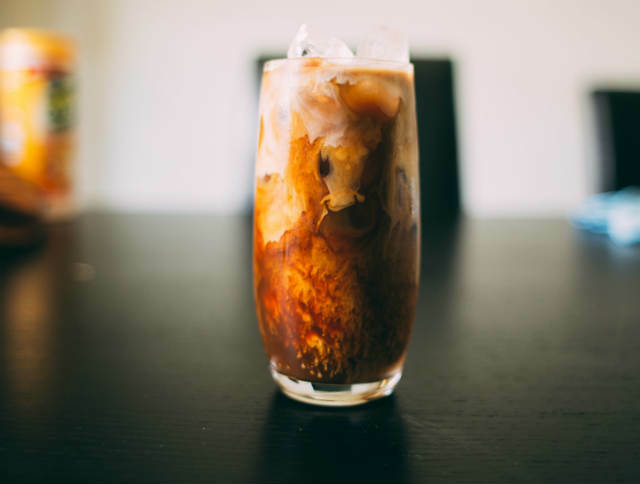 To create a late summertime buzz, why not try experimenting with iced lattes? Cost-effective, simple and still a rapidly growing trend, the iced latte takes no back seat to cappuccino anymore. The key to nailing this mix is the quality of your beans, and of course high quality syrups, of which the most popular are: Vanilla, Caramel and Hazelnut. Brew your espresso, using the best possible beans. With some machines you can adjust the coarseness of the grinder to a fine setting, and also make sure the strength is at max. Pour the syrup into a measuring cup or milk frothing jug. If you’re keen to switch up the décor, keep your guests coming back for more with high quality mix and match table tops. In the meantime, pop into one of our many stores or hit us on the web for more essential catering tools and equipment.